A balance trainer resembles a bisected yoga ball. It is an innovative style of fitness equipment that is able to provide high-intensity cardiovascular workouts, strength training, and is specifically engineered to improve your flexibility and balance. In design, what it actually is is a rubber dome that is built into a circular rigid platform. They can be used dome side up and with the dome side down. By providing and dynamic and unstable exercise surface, this instability provides a challenging exercise workout with a variety of different applications. Let's take a look at 5 of the best-selling balance trainers on the market today. The Bosu Balance Trainer is our favorite! 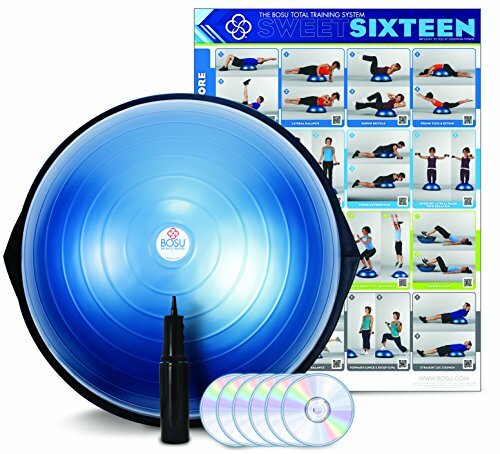 The Bosu home balance trainer Is our top pick- its got tons of raving fans, a relatively affordable price, is US-made and ships with workout DVDs, a high-quality owners manual and an easy-to-use air pump. It provides a rigorous workout designed to improve your flexibility and balance, burn calories, and truly supports an unlimited array of different exercise options, all of which can be done from the comfort of your own home. How does balance training work? By targeting your muscle core, you'll be able to gain a good deal of strength, tone your midsection, provide overall strength to your body and dramatically improve your balance. The dynamic exercise surface area provides flexibility for range of different styles of exercise-you can jump on it, lay on it, kneel on it, essentially challenging your body in a range of different positions. In essence, this rather small piece of home exercise and fitness equipment packs an outsized punch. If you end up purchasing the Bosu balance trainer, one of the cool things is that includes a high-quality manual to instruct you on the best exercises for beginners and more advanced practitioners. You can also make use of the DVDs that they include, and that are available for individual purchase, that customize the exercise regimens for the outcomes you are looking for-specifically for athletes that are looking to get an advantage on the field or court. That said, you can certainly get by just using YouTube to search for balance trainer exercise videos- there are ton of people out there producing great core-strengthening video content that you can follow along with as you use your balance trainer. What are the benefits of a balance trainer? ​What are balance trainer users saying? Some users struggle between selecting the Home Bosu versus the Pro Bosu-one user writes that the home version has 2 pounds less rubber, they found that the home version was completely fine for them as long as they stayed under the prescribed 300 pound weight limit. Another Bosu purchaser writes that they filled it up to a height of 9 1/2 inches which to them seem to full, though Bosu itself advises that it should be around 10 inches high. One individual who had had knee surgery had his physical therapist use a balance trainer several times as part of his rehabilitation practice. He writes that it was very effective for him, helping him to regain strength, balance and coordination, although sometimes he had to hold onto something sturdy as he performed exercises. Another user commends the Bosu balance trainer for being the most versatile piece of fitness equipment that he had ever used. He claims that for him it is the most dynamic piece of exercise equipment that he has found, enabling him to perform high-intensity exercise, whether it be dome down as a wobble board or dome up. Balance training can be an incredibly effective method of exercise and fitness development for people of any age and ability. It is easily folded into pre-existing exercise regimens. 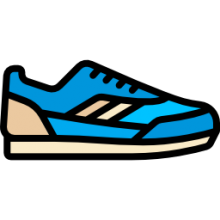 It is also a form of exercise that is particularly useful for people rehabilitating from injuries, surgery or even for the elderly as part of fall prevention training. How to use a balance trainer like a boss! Athletes enjoy them, as well, because it allows them to generate more power in their vertical leaps and to leverage force resistance to increase their training rigor, which leads to gains on the basketball court or football field. The effect of balance training is to challenge the body to keep control over posture by putting it into a range of physically demanding motions and activities that include highly advanced transitional movements. These movements and exercises can be incredibly complex and demanding. Probably the simplest exercise you can perform is just standing on one leg on the dome outside of the balance trainer or wobble board. As users get more accustomed to using these balancing devices, they can begin experimenting balancing on one leg while unsupported and then performing more dynamic physical movements that include jumps, hops and steps that are much more challenging in nature. With greater amounts of practice, your balance will improve, and it is likely that your posture will improve, as well. You or your client will begin to become more centered in their movements, increasing your physical efficiency, and helping you or your practitioner to develop greater fluidity in their movements. Joint stabilization will increase as will the body's ability to maintain healthy joint alignment during physical movement. This type of dynamic joint stabilization is essential to prevent injuries as well as to improve athletic performance. When first starting out, some of the more common exercises include balance leg reaches, balance arm reaches, lunges and hopping. As a beginner, or if you are a personal trainer or physical rehabilitation therapist, it's crucial that you have the individual remain exercising within their personal ability thresholds. This means that they should be allowed to move slow or fast as they are able to do while controlling the movement with each and every repetition. The use of instability will force muscles to stabilize during the movement- in this respect balance trainers are similar to stability balls, wobble boards and other types of instability devices that force muscles to activate as if you were standing on a unstable surface. If you're looking to purchase a balance trainer, read our reviews above and check out the comparison table. If you are a beginner, make sure you read the instruction manual prior to using the balance trainer. There are also some great videos online that will educate you on the different styles and types of stability exercises you can accomplish using them. Purchasing online will ensure that you get fast shipping and a solid return policy should you need to exchange your item. That said, user feedback for balance trainers, particularly the Bosu brand, is raving- and it's likely that you will get a good deal of use out of it if you are committed to home exercise.